I am going to do something different with the Goodreads summary for Cinder. I am going to bold all of the things that made me want to read this book. Here we go. So Humans and Androids? Already sounds interesting right? Yes. We would be right. The intermingling of humans and machines, and human machines is awesome and unique. The machines are integrated into society just like watching a cool updated Jetsons. The futuristic piece of this novel is very well done! New Beijing? So this is set in the East somewhere. I LOVE Asian type books. Unfortunately this isn't maximized to it's full potential, but the mentions of the culture are there if you look. They use chopsticks, the celebrations are decorated in red and gold, things like that. But outside of the Chinese honorifics and these side things, it could very well be set in America. What's next? Gifted mechanic cyborg Cinder? Yes please! I love that she is, well, useful for lack of a better term. She takes control of her own destiny despite obstacles in her path. She is a very strong lead and the serious highlight of the story. Step-sister's illness. 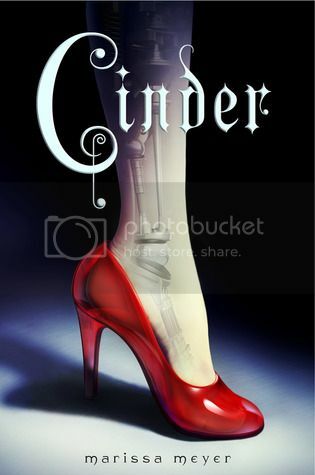 So I see this and I read that while it is a Cinderella retelling, Meyer also makes it her own. And it really succeeds at this. Meyer takes a fairy tale that we know from either the original story or the Disney movie and seamlessly interweaves the plot points into an awesome retelling. Intergalactic struggle huh? Spcae?! LUNAR PEOPLE! Well yup. There is an evil moon people and a fun story-line surrounding that. This and the post-apocalyptic atmospheric make it a wonderful SciFi dystopian. Forbidden attraction. Yay, a love story! Yay, not a love triangle! I love myself some forbidden attraction. Outside of all of that, the story was very fulfilling. A little more world building would have been cool, but there are three other books in the series. Kai's character is starting off okay, but I look forward to reading more about him and watching him develop further. Cinder however is awesome and probably one of my favorite heroines that I have read in a while. The twist, if that is what is was suppose to be, is really predictable as is the story if you are at all familiar with Cinderella, but I don't think that is a bad thing. It is a GREAT start to a new series that I know I will be devouring as they come out! If you like fairy tales, dystopians, scifi or YA, check this out! And the cover? Totally cool. I completely felt the same way about this book. A little more world building would be great...but did not detract at all from this story! I was completely hooked and loved every minute of it...and cannot believe that I have to wait a YEAR for a sequel! Thanks for your review! I've been eying it for awhile wondering if it's worth the read. This is on my GoodReads "to read" list..along with 300 others. Maybe I should pop it up along the list. I've been very into YA dystopia lately. LUNAR PEOPLE! CYBORGS! CINDERELLA! How can this possibly all work together? I don't know -- but it does. Loved this book. Not going to comment on how many great reviews I've seen for this or how I really need to read it... Great review! Yes, yes, yes, I ADORED Cinder! I am currently reading Cinder and I am totally sucked in and impressed. I LOVE the cover. I've been very skeptical about this book. I just don't think that this is my type of book. But since this is like the 5th book reviewed at a perfect 5 stars, looks like I'm gonna give it a go. Not to detract you from reading it, but on Goodreads I rated it a 4/5 because i really like it but there were minor things that bothered me. One was the word building and second that I didn't mention too much here was Prince Kai. He's not as developed as Cinder. I totally agree, I loved this retelling! I feel like Marissa Meyer did a wonderful job of keeping the structure of Cinderella, while still making it her own. I love retellings, but lately I feel like the ones I've read are either so close to the original it's almost boring, or so far from the original that it's barely recognizable other than at its barest elements. Cinder is the perfect balance, and I can't wait to read the rest of the series. That was a cool idea to bold what interested you in the summary; there are so many reasons to give this a shot and it framed the review well. I was drawn n by the Cinderella story but my favorite part ended up being the romance. Kai is a great guy-responsible and caring. Hopefully they will have a compelling fight with the lunar people. Thanks :) I think it stemmed from being at a loss at where to start this review/reviewing it in a new way. And I really was pulled in by those things. I liked the romance too. I am interested to see where it goes in book 2. Not into YA or dystopian, but all these positive reviews are really starting me to wonder! I may yet pick it up. This book had me at cyborg Cinderella. Seriously how could you go wrong with that idea. One of my favorite galleys I've read recently. Thanks for the review. I just got my copy in my mailbox last week. It's on my TBR list. I reviewed this book on my blog, too, and LOVED it! I am not usually a sci-fi fan, but read it as part of a reading challenge I'm participating in. I agree... I, too, will be devouring this entire series! I totally agree that this is a great book. I also saw the twist coming. Have you read the rest of the series? I love how she ties all the fairy tale together.